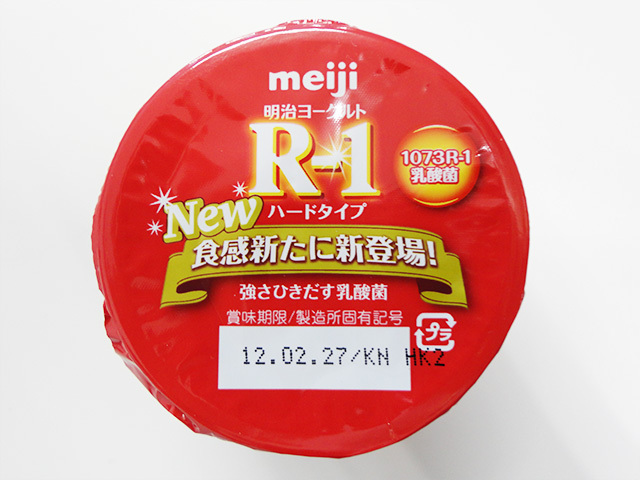 Meiji R-1 Yogurt is not just another probiotic yogurt on the block. In addition to the great benefits you get from eating probiotic foods it gives you more. Probiotic yogurt health products like Meiji R-1 Yogurt have taken off in Japan and throughout the world. When it comes to dieting to boost immunity in your system, there is no better way to keep on top of your game eating yogurt. What is a yogurt drink to boost immunity in your body? 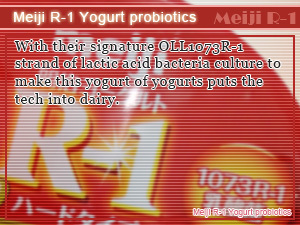 When the news hit that R-1 (or namely 1073 R-1) a lactic acid bacteria strain found in Meiji R-1 Yogurt may help boost immunity, all shelves wear left empty. A study carried out on mice concluded that mice fed with 1073R-1 fermented yogurt displayed resistance to the influenza virus. Just as in any other yogurt diet simply eating yogurt on a day to day basis help strengthen a weak immune system, especially important when you want to develop immunity to the influenza virus. When it comes to boosting your immune system natural eating Meiji R-1 Yogurt may be the way to go. In this healthy Slism, we bring to your from the far but not forgotten corners of the Japanese Diet beyond eating rice, Meiji R-1 Yogurt for boosting your immune system with yogurt probiotics. Here you will find probiotic foods and other diet and health products that you may like. 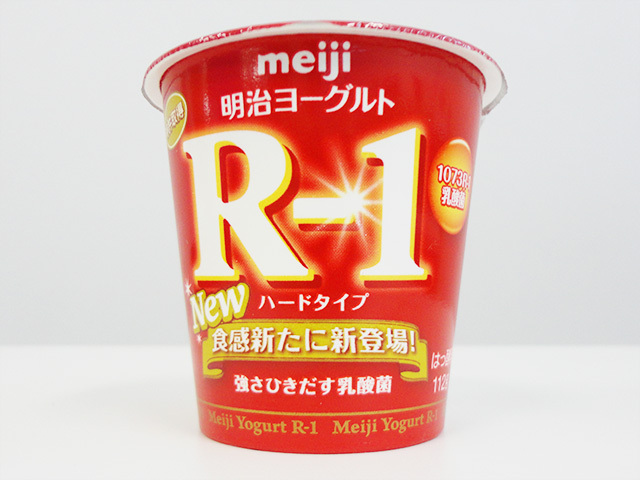 Meiji R-1 Yogurt is a store-bought yogurt that contains the revered 1073R-1 strain of lactic acid bacteria said to work as an immunity boosting agent that is great for staying off the sickbed when you should be out enjoying yourself and hitting the gym. This lactic acid bacteria OLL1073R-1 in particular is a type of Lactobacillus bulgaricus that is said to contain large amount of extracellular polysaccharides Exopolysaccharides(ESP) that studies suggest has the following benefits in your diet. ESP in your body is said to help active Natural Killercells that are supposed to repel the influenza virus from causing further complications through infection. 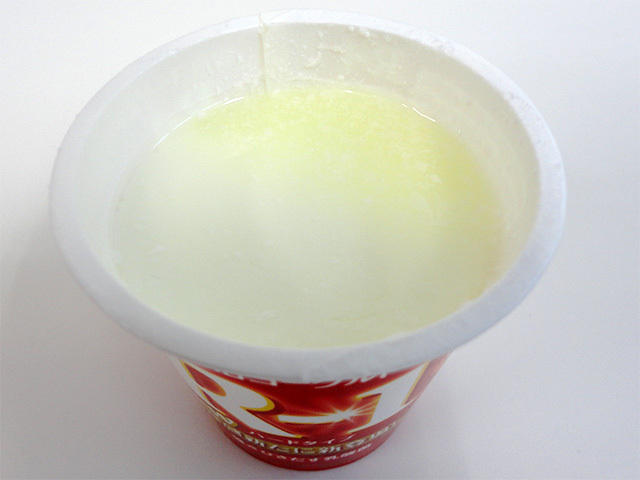 In terms of taste and texture, Meiji R-1 Yogurt differs very little from other probiotic yogurt brands of plain yogurt. With so many benefits to your body, it almost seems like R-1 should taste different. That would be the case if it were a secret. Luckily enough it is not. When it comes to giving your body the tactical advantage against influenza and the cold, it is said that nothing works better than wearing a mask to prevent nasty germs from spreading from you and others especially in crowded areas like Japan. The term Mask Clanrefers to the Japanese custom wearing a mask when outdoors. Combining mask wearing with a probiotic-rich yogurt diet such as that of Meiji R-1 Yogurt may be your best bet on keeping off the sickbed staying active. Along with giving your body a fighting chance against spreading health concerns like influenza or seasonal colds, eating yogurt helps improve gut flora effectively treating constipation. As you know by now through personal experience or way of word, constipation not only causes unscheduled problems to pop up proving to be an inconvenience in your daily life but also is slows down your metabolism affect the fat absorption of your body during digestion. In fact, it is not uncommon to have your diet crumble your efforts to eat a balance diet just because a book says you need to eat this eat that all for the sake of reducing calories in your diet. By itself, this is one cause of constipation. When you diet goes out of balance and you are not getting enough nutrition in your meals, your immune system grows weak. In this state you are more likely to catch a cold or even be infected with a deadly influenza virus. To avoid situations that may slow down your metabolism or even make you sick, getting balanced nutrition in your diet is the key to success. Simply adding R-1 to your yogurt diet you can boost your immune system lowering the chances you get held down by influenza or the cold. Chances are not slim that stocking up on R-1 could be a problem in itself, especially when it is being bought by the cases by other yogurt maniacs. If you got in line and we're left unsatisfied being told that Meiji R-1 is out of stock there is still hope for you. There are foods you can eat to boost your immune system that are recommended for people that don't have Meiji R-1 Yogurt available. The chance that you are going to find Meiji R-1 Yogurt being sold at your local grocery store is slim to nothing to say the least. So where I'm I supposed to by the stuff? You may be asking yourself right now. The answer is Rakuten. Rakuten, an Amazon-like online retailer that prior for people living outside Japan wasn't available until they went global with Rakuten Global Market. Now that they ship all over the world with competitive prices, you shouldn't have any excuses for not being able to get R-1 when you want it. For weight loss there is no more natural solution than dieting on probiotic yogurt. Roundup of simple to follow diet plans, health products, and tasty recipes. Brewer’s yeast in yogurt makes the best food combining recipes for helping to satisfy your appetite and even help get rid of constipation for good. With their signature OLL1073R-1 strand of lactic acid bacteria culture to make this yogurt of yogurts puts the tech into dairy. Medication is only temporary immunity last forever. Rely less on over the counter drugs that only make you feel better. Probiotics for immunity. Don't cry just because Meiji R-1 Yogurt isn't sold yet at your local grocery store just yet. The age of globalization brings you Rakuten.